Manufactured with a heavy-duty steel tube frame and powder-coated finish, this equipment will last a long time. Its long and wide backboard features high-density padded leather upholstery for your optimum comfort, balance, and support. It also has four foam hold down pads and a padded head rest to give you extra support and comfort when working out. HEAVY-DUTY CONSTRUCTION - This product features a heavy-duty steel tube frame for increased balance and durability. The powder-coated finish has a great look that is resistant to water and corrosion. EASY STORAGE - The locking pin allows you to easily fold the bench and keep it in storage after you work out. This board can also be brought anywhere you like, thanks to its compact design. 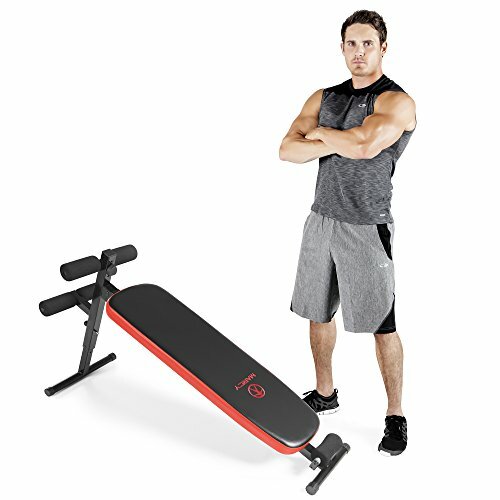 4-ANGLED POSITIONS - This board features four incline or decline positions, making it perfect for a wide variety of fitness routines. It enables you to perform muscle-building exercises without having to leave the comfort of your home. OPTIMIZED BACKREST - The longer and wider backrest made of deluxe high-density padded leather upholstery offers you comfort, balance, and support. FOAM PADDED - This slant board has four foam padded handles for increased grip throughout your workout. It also features a foam padded headrest for head support.